Today is going to be a treat for those of you following this blog. I eat at two South Bay locations that are unique. After my friend Jean-Yves heard that I had lunch at Google a little over a week ago, he insisted that I join him for lunch at one of the better restaurants on the Google campus. I joined him today at Cafe 7 where fresh sushi was served. Was the sushi quality any good? I'd say it was as good as any decent sushi restaurant - which is astounding since they provide the meals for free. 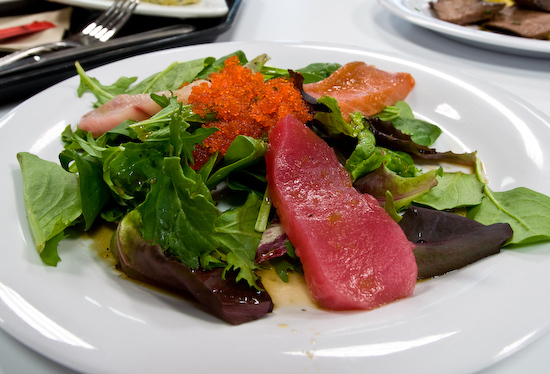 I salad was very nicely dressed with a sweet and tart dressing that paired will with the salty tobiko and fresh sashimi. The nigiri was good - the tuna and salmon as good as any I've had. 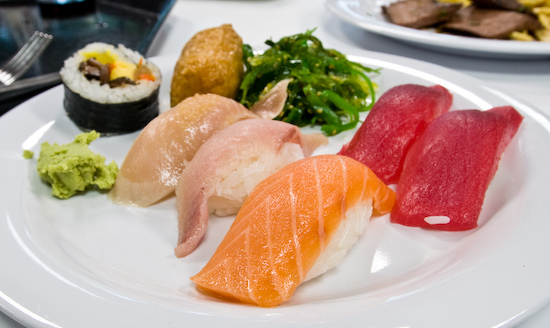 The yellowtail and white tuna were of fine quality, but I've had better. (The texture was slighlty mushier than I prefer.) 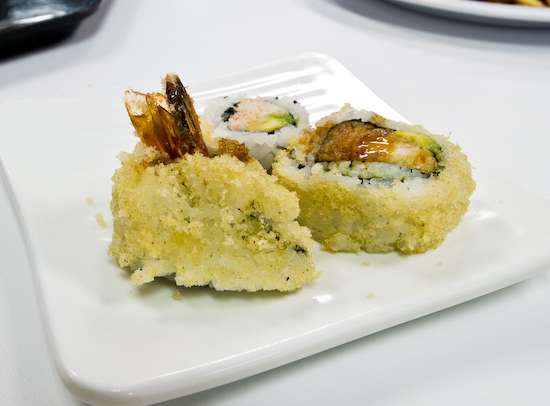 I felt the futo-maki was a little too sweet for my taste. The cooked rolls that I had were also good. I ended my meal with a small cone of berry soft serve. Tina and I headed over to Alexander's Steakhouse (10330 N. Wolfe Road, Cupertino, CA‎ - (408) 446-2222‎) with the intention of tasting A5 Grade Japanese Wagyu beef (the so-called Kobe beef). There are only a few restaurants in the United States that serve A5 Japanese Wagyu regularly and Alexander's is the only one I know of that prepares it as a full steak. I felt I needed to do this so I'd know what Japanese Wagyu tasted like and whether or not there was a difference between Wagyu from Japan and Wagyu from elsewhere (I've had a decent amount of both Australian and American wagyu). Chef sent out an amuse bouche to start our meal after we ordered our beef (ribeye cap from the Miyazaki prefecture). 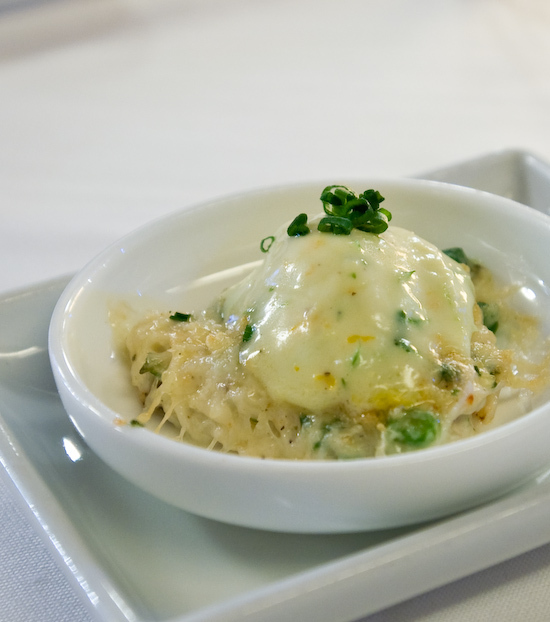 The server who delivered our amuse described it as asparagus and corn gratin topped with citrus mascarpone. It also clearly had crab in it. It was tasty, but nothing to rave about. We had heard from several other people (since our last visit to Alexander's) that the hamachi shots were excellent - so we ordered six of them. To eat them, we picked up each cup, tossed our heads back, and shook the cup until everything plopped into our mouths. When I downed the first one - I felt like the flavors were going crazy in my mouth. There was too much stuff going on - thinly sliced hot chiles, truffles, citrus, soy sauce, ginger, avocado, and, of course, the hamachi. The second shot was much better since I knew what to expect and could differentiate the flavors as well as letting them combine and enjoying the flavors together. The presence of the avocado piece really helped make the whole shot creamier in texture. The third shot was pure delight. I really recommend ordering three of these per person so you can really enjoy them and taste all the flavors going on in the shot. A second hamachi dish was then presented to us - a "half and half" tartare. 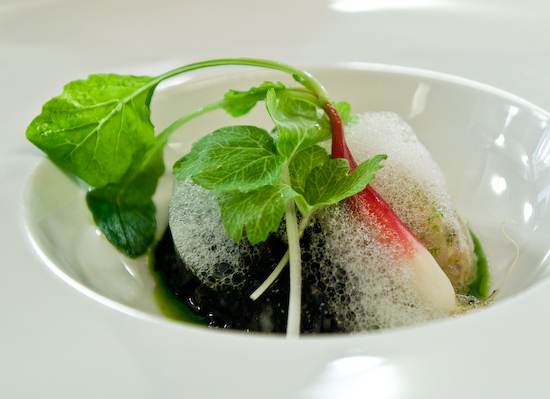 The lighter side was a plain tartare with a hint of citrus while the darker side was colored with squid ink and also contained a few small bits of squid. They were served with potato "chips" that were topped with nori strips. 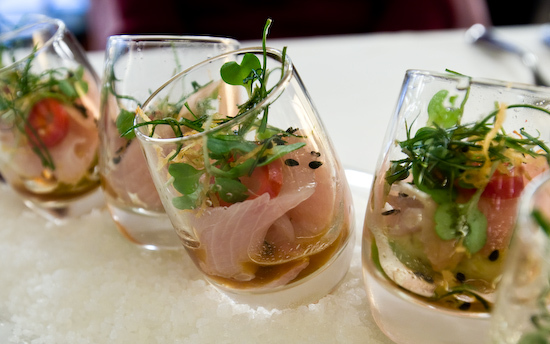 With this dish following the hamachi shots, it just didn't work for us. The tartare was a bit too light in flavor to follow the shots which had many powerful flavors. The potatoes didn't seem to add much to the tartare except a little texture, but I found them a bit cumbersome to handle (as opposed to using melba toast or crostini). Overall, I think the dish was well executed, but following the hamachi shots just didn't work that well. We then had a foie gras course - a cold preparation of a foie terrine (where the foie was so fine that it was almost a mousse) with a Sauterne gelee topped with crunchy bits (I think he said they were crackers or something) and foie powder (foie gras fat with maltodextrin). The terrine was served alongside a Medjool date compote (which was spiced up with some ginger), fresh radishes, and crostini. 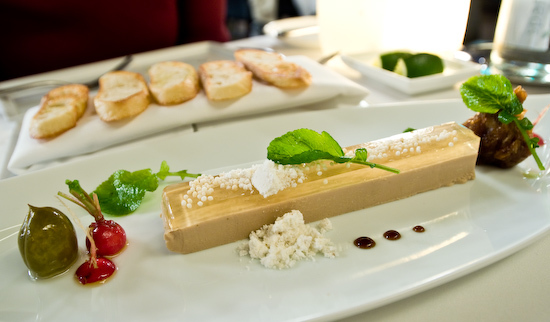 Together, this was a wonderful foie gras preparation. The flavor of the foie gras was strong but not overpowering and perfectly salted. Combined with the sweet and winey gelee, the dates, and a drop of Chef's truffled demi-glace made this one of the best foie gras combinations I've ever had. 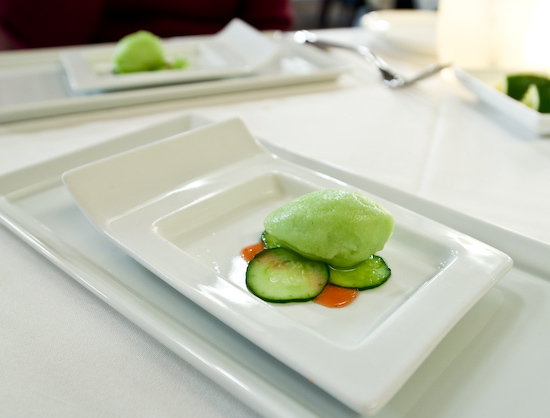 As an intermezzo before the beef, we received a cucumber sorbet served on crispy cucumber slices and a strawberry coulis. Excellent. Then the beef arrived. This was no ordinary beef. Alexander's serves A5 Wagyu beef from five different prefectures. I chose the Miyazaki because I was informed of their consistent quality and because Chef's used this prefecture the longest. I chose the ribeye cap (my favorite cut) which is usually strongly flavored and tender when properly prepared. Wagyu beef is supposed to be rich and heavy already, and here I was picking the strongest flavored and richest cut of beef. Our piece (cooked rare to medium-rare by request) was probably about 6-8 ounces and had a marbling score of around 10-11 (where 12 is the maximum marbling score). At $195, each small bite of this steak would be $20-30. The steak was incredible. There's nothing else like it. I went into this thinking that there would be a subtle difference between American Wagyu steak and Japanese Wagyu which would require a trained palate to really appreciate. Not the case - the difference was night and day. It was like the difference between USDA Select and USDA Prime. The steak we had practically exploded with flavor in our mouths. I'll describe it, but it may sound too clinical: Each bite causes liquid to rush out of the meat. This fluid is liquefied beef fat that melted into the meat fibers while being heated. The fat is warm, light, and smooth and floods the mouth coating the entire cavity. The texture of the steak was so tender that Tina described it as like that of a marshmallow. The flavor is richly beefy without being overpowering. There's absolutely no tallow taste - it's just a light but rich. I would describe it as the difference between a mediocre dark chocolate and a fine dark chocolate. In the mediocre chocolate, darkness usually means a powerful chocolate flavor with intense bitterness that screams "THIS IS DARK CHOCOLATE". In a fine chocolate like Amano, the dark retains the chocolate flavor, but other flavors assert themselves and are well blended with the bitterness. In the case of the beef, the strong flavored beef that I've had before have a strong beefiness but feels heavy and overpowering. The Miyazaki Wagyu we had was strongly flavored but well balanced in the same way that a fine dark chocolate is well balanced. I actually teared up from the enjoyment of eating this piece of meat. Is it worth the money? That's up to you. Tina and I agreed it was clearly worth the money for us. There's really nothing to compare it to. For other foods, you can judge its worth buy comparing it to other similar foods and comparing prices (once you've decided you want to eat it). For this, if you want to eat it, you pay for it - there's no other choice, no other alternative, no other comparable food. 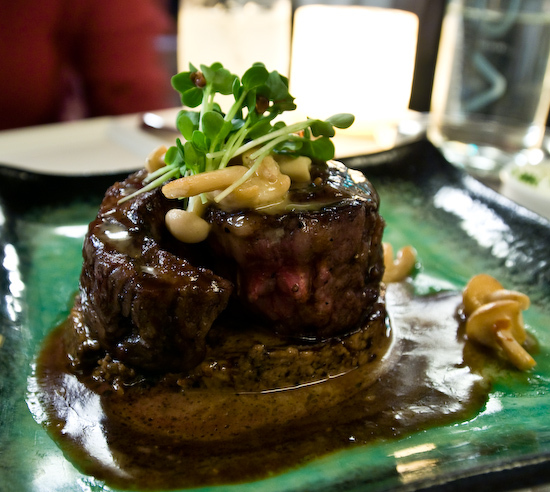 The next time we are back in the Bay Area, we are eating at Coi and the A5 Japanese Wagyu steak at Alexander's Steakhouse. No question about it. I had a moment where I was realizing the decadence of the experience. Most "Kobe beef" is eaten sliced thin and served in shabu shabu or lightly grilled and over rice due to the richness (and, of course, the expense). Here we are eating this incredible beef as a steak. A large solid chunk of the most expensive beef in the world. That's decadence. 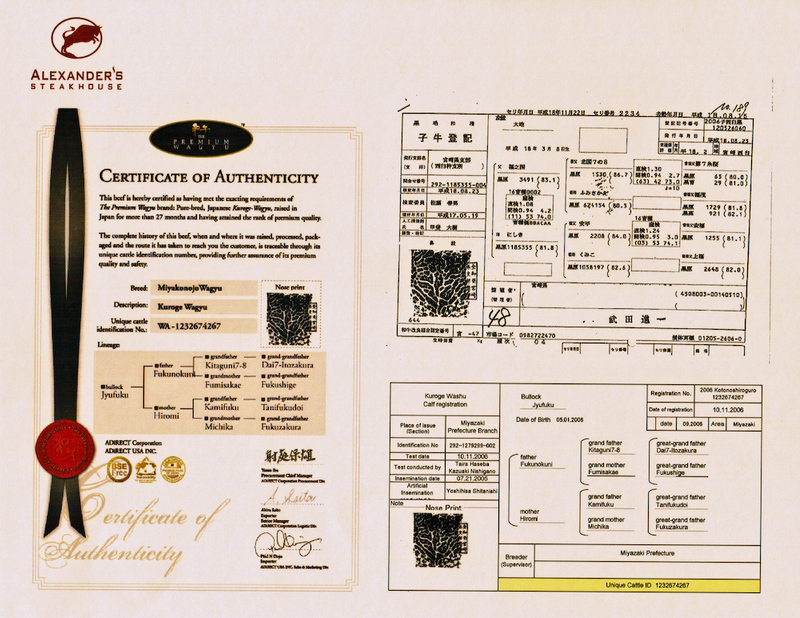 I should also mention that our steak came with a Certificate of Authenticity complete with his name, birthdate, nose print, and pedigree. Tina would rather not think about the fact that we ate part of Jyufuku, son of Fukunokuni, and thought he was one of the most delicious things we had ever put into our mouths. I don't have a problem with it and have read my Certificate several times now (the last time noticing that gestation period for a cow is very similar to humans - just a little over nine months). 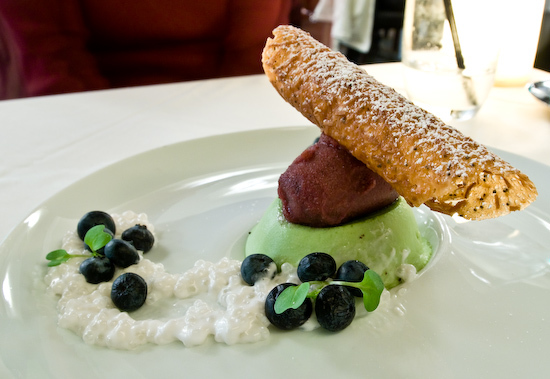 Finally, they sent out a dessert - basil panna cotta and blueberry sorbet topped with a basil and poppy seed tuile with coconut tapioca pearls and fresh blueberries. It was delicious as well. The next time I win the lottery. Wow, that's a great looking steak. Did they sauce it? What was it? It was sauced witha truffled demi-glace. Very good, very potent. as I mentioned, I think Alexander's is only mediocre compared to other great restaurants. i find often times their flavors just never come together. I admit I haven't tried their wagyu. and i completely agree with you. it is impossible to explain to somebody who has never tried wagyu what the experience is like. american wagyu does not even come close, it's just overglorified angus. 1) Alexander's does have a great name. 2) i used the term american wagyu despite being utterly opposed to that terminology. wagyu by definition must come from japan. Scott, you are a magician (or just a really big fan of) Check Please Bay Area! I'm going to watch the segment while I pack up more of my room. 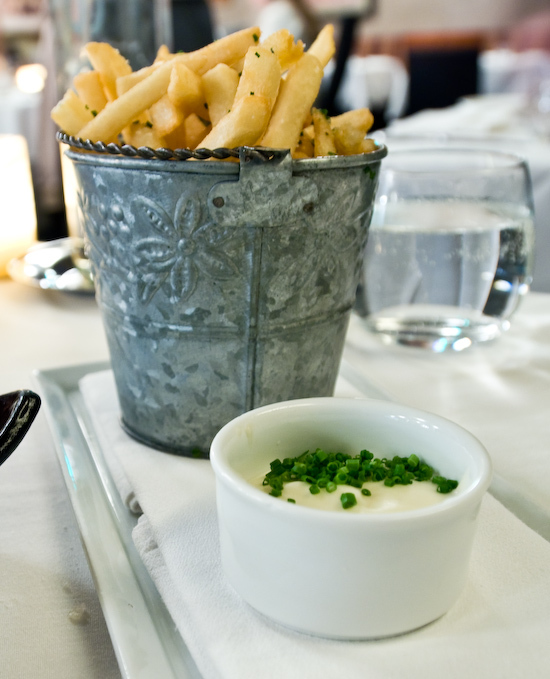 I found it incredible that of the two guests who ate at Alexander's (on Check Please!) one of them didn't have any beef. I do believe they have the best quality beef in the Bay Area, but if you go for the non-Wagyu they are good quality but not life changing. As I think about it more, I do prefer The Grill on the Alley's steak (even though it's not dry aged) to Alexander's, but my honest advice is learn to grill steak at home really well so you can save up and go to Alexander's for the Wagyu. I'm no magician…you just happen to eat at places that I've seen on recent episodes. The taco truck one was a search, though…because I didn't remember what the name of the truck was that they reviewed, so that one I plugged the trucks name into YouTube search along with the show's name. I am a big fan, though…but everyone's been too agreeable lately. They all like each other's places except maybe parking, or they thought it was a bit pricey. No one's been baving horrible experiences…which drive's my girlfriend's list of places to go. If anything bad happens anywhere, it's "I'm not going there anymore." A couple night ago, at a local chinese and vietnamese place, the chef came out and grabbed a toothpick near the entry. Apparently, that grossed her out, and she's not going back (rolls his eyes).